Red Sky Stage is a coffee house style performing arts venue in Downtown Petoskey’s Gaslight District featuring live music, poetry, comedy, drama, painting, and other arts. Welcome to Red Sky Stage! Red Sky Stage is growing! We have hosted a strings jam session that is overflowing with participant, talent and folks stopping by to listen. We have staged a variety show, presented quite a few concerts, magic shows and and stand-up comedy nights. 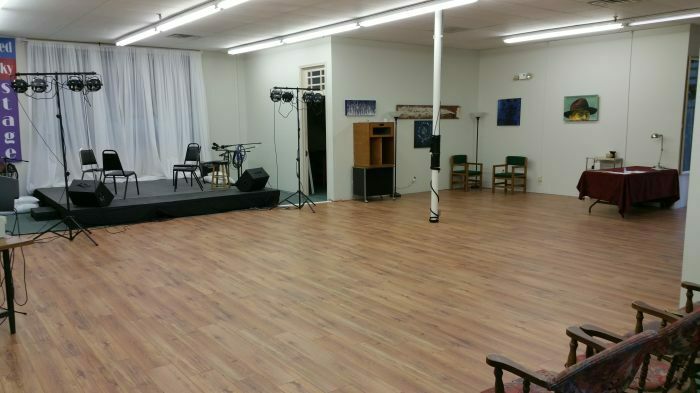 In March 2015 we installed a brand new one thousand square foot dance floor so fans of the Up North Big Ba nd and many other folks now have a place to dance We are looking for lots of great new things to do on the new floor. Meanwhile, it is very pretty and some people say it has even improved our sound. We have hosted a play, an Earth Day celebration and several benefit concerts. And we have improved our stage and added a vintage acoustic upright grand piano and a Hammond M-3 organ. We still have much more to come in the near future ( jazz concerts, chamber music, etc.) as we create an informal, coffee house style venue for the performing arts right here in beautiful Downtown Petoskey. Red Sky Stage is also available for rental for meetings, presentations, conferences, birthday parties and anything else that is compatible with our very flexible and convenient space in Downtown Petoskey. Call for details and to make arrangements. We invite you to keep track of our progress here as well as on Facebook, Twitter and our Blog, Northern Michigan Art (which covers both the performing and the visual arts). Better yet, come see us at 445 E Mitchell St in Downtown Petoskey's historic Gaslight District. 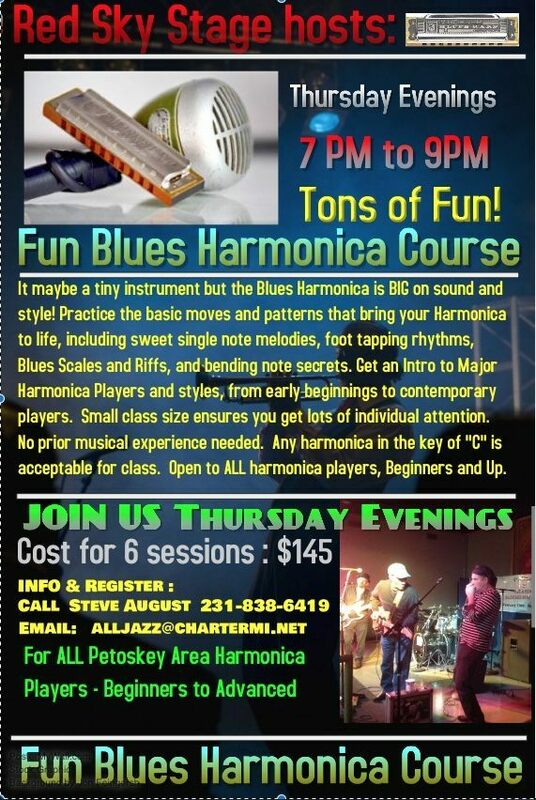 Join our Fun Blues Harmonica Class! Sign up for our Red Sky Stage email newsletter. This is a local Northern Michigan ticket service based in Traverse City. Click HERE for details. 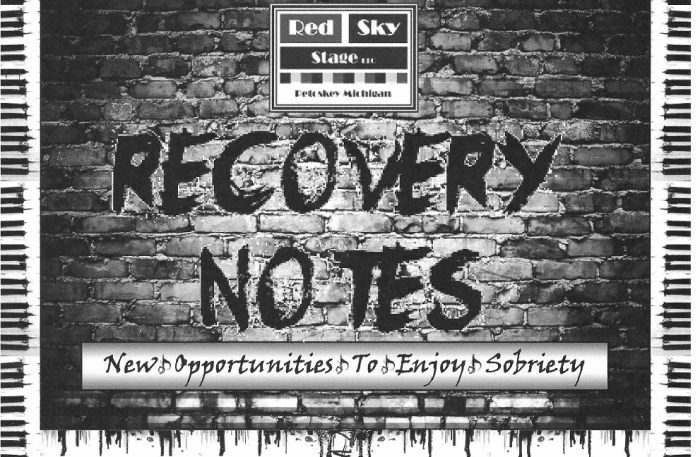 9 and 10 News reporters and a film crew stopped by one of our recent planning and rehearsal sessions for Recovery ​Notes, our new monthly jam session and safe night out on the town for folks in recovery from alcohol or drug addiction. You can read the resulting article and video segment right here.then stop by Red Sky Stage on the second Sunday of every month at 7:30 - 8:30 and check it out for yourself. Admission: Free but donations are accepted. Copyright©2019 Red Sky Stage - Produced by Gaslight Media, All Rights Reserved.